Blue Horseradish has implemented successful paid search advertising campaigns for many clients. Blue Horseradish’s emphasis on customization and flexibility helps control costs. Additionally, Blue Horseradish’s spend analysis and continual improvement philosophy can reduce cost and ensure clients get the most out of each ad campaign. While some paid search advertising providers create client ad campaign accounts in their own names, Blue Horseradish creates accounts in clients’ names. This means there is no loss of continuity or history if the work is later taken over by the client. Blue Horseradish is a certified Google Partner. The team works closely with a dedicated Google Representative and meets all requirements necessary to maintain this certification. 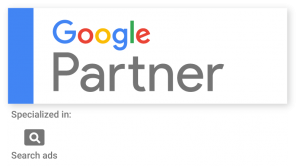 As a certified Google Partner, Blue Horseradish is required to post Google’s AdWords Disclosure Notice / Avertiser Guide: Working with a Third-Party Partners here. Blue Horseradish follows Google’s guidelines to provide clients with transparency in client engagements for paid search advertising. Blue Horseradish’s typical strategy is to augment clients’ organic SEO activities. Paid search advertising supports SEO, but is typically not the primary — and certainly not the only — online marketing activity. When launching a website on a new domain. New domains inherently have low link popularity, so it is necessary to bolster SEO with a robust advertising strategy. In addition to getting more web traffic for certain keyphrases, a solid paid search advertising strategy can help test new keyphrases, check their current popularity, and determine whether or not they produce qualified leads. Blue Horseradish also advises using it as a competitive strategy when competitors rely heavily on it. Lastly, Blue Horseradish recommends maintaining the strategy when metrics indicate it is providing a good return on investment. Blue Horseradish is looking for a few good companies to work with on paid search advertising… companies that want to get more out of their website and online marketing. Interested? Contact Blue Horseradish now to start getting results.